Solid-state lighting (SSL) has evolved to a point where the light-emitting diode (LED) is now the preferred light source for many lighting applications. The LED lighting system is a mostly mature technology, and LED market transformation is estimated to approach 50% by 2025. Organic light-emitting diodes (OLED) for lighting applications are also on the horizon. Research and development work is now moving toward exploring how SSL can be customized and how to use lighting to gather information that provides greater value to both producers and users. 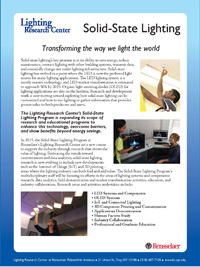 The Lighting Research Center's Solid-State Lighting Program is expanding its scope of research and educational programs to enhance this technology, overcome barriers, and show benefits beyond energy savings. The LRC’s Solid-State Lighting Program is led by LRC Director of Research N. Narendran, Ph.D., who also oversees the LED Lighting Institute, a professional education program in solid-state lighting available twice a year at the LRC laboratories in Troy, New York. Lighting applications that use light-emitting diodes (LEDs), organic light-emitting diodes (OLEDs), or light-emitting polymers are commonly referred to as solid-state lighting (SSL). Unlike incandescent or fluorescent lamps, which create light with filaments and gases encased in a glass bulb, solid-state lighting consists of semiconductors that convert electricity into light. LEDs have been around for more than 50 years but until the early 2000s were used only in electronic devices as indicator lamps. Technological developments in the last two decades have allowed LEDs to be used first in signal devices, like traffic lights and exit signs, then in some limited illumination applications, such as flashlights, and now for many general illumination applications, from homes to commercial spaces to outdoor lighting. Since 2001, the Lighting Research Center has been instrumental in conducting research to make this transformation happen. Long life — LEDs can provide 50,000 hours or more of life, which can reduce maintenance costs. In comparison, an incandescent light bulb lasts approximately 1,000 hours. Energy savings —The best commercial white LED lighting systems provide three or more times the luminous efficacy (lumens per watt) of incandescent lighting. Colored LEDs are especially advantageous for colored lighting applications because filters are not needed. Better quality light output —LEDs have minimum ultraviolet and infrared radiation and can be tuned to any color appearance. Intrinsically safe — LED systems generally are low voltage and cool to the touch. Smaller, flexible light fixtures —The small size of LEDs makes them useful for lighting tight spaces. 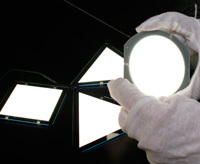 OLEDs are flat and flexible, allowing for unique applications. Durable — LEDs have no filament to break and can withstand vibrations. Solid-state lighting promises to change the way we light the world. The LRC is looking for answers to the challenges and opportunities offered by solid-state lighting. Visit the Key Research Accomplishments and Recent Projects pages for more information on the LRC's solid-state lighting projects.